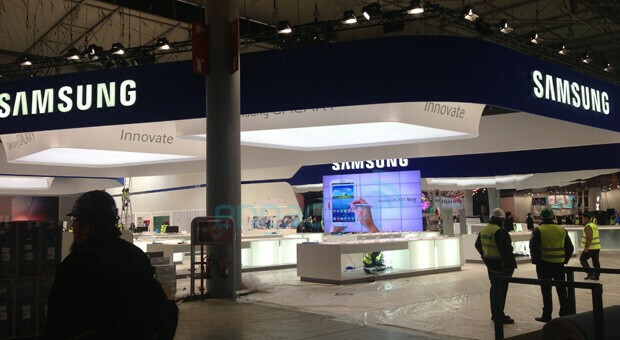 Just days before the start of MWC 2013 in Barcelona, a picture has been snapped of a booth with a display showing off the Samsung Galaxy Note 8.0. Yes, Samsung's mobile head J.K. Shin had already confirmed that the tablet would be appearing at MWC, but it still is nice to see the display anyway. A piano doesn't have to fall on our heads for us to realize that this tablet is aimed right at the Apple iPad mini and its 7.9 inch display. It's a good move for Samsung because the "Note" series of phones and tablets includes a number of features that Apple's tablet just doesn't offer. Besides the S Pen, the Samsung Galaxy Note 8.0 offers Air View which allows you to hover over the screen with the S Pen and open up an email in a separate pop-up box. Smart Rotation uses the front-facing camera to make sure that the screen is always oriented correctly. The front-facing camera is also used in the Smart Stay feature which allows the screen to stay on as long as you are awake. Once you fall asleep, so does the screen. Multiwindows allows the user to split the screen in two rqual parts so that two apps can be used at the same time. There are many other features that Samsung has baked into its Note series. 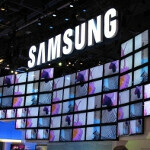 MWC starts on Monday and besides the Samsung Galaxy Note 8.0, there will be a number of new phones and tablets revealed. The best way to find out all about the devices that everyone will be talking about is to keep your eyes right here for the best MWC coverage. 2 more days to go.... Oh, the excitement! What else will Sammy tease us with? And then there is Nokia. Tick-tock, tick-tock. 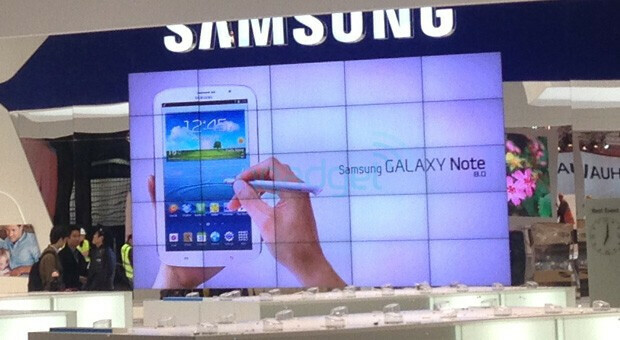 So it has note 2 specs with bigger screen and battery? No cellular phone (for voice calls). Maybe a cellular data modem option? I'm thinking it does have voice. Look at the top there looks to be an earpiece grill. The Note 8.0 needs to be less than $350 or I'm going to get the Nexus 7 and call it a day!! I'm hoping for 299, if not I will get the Nexus 10 for 399. I will wait untill it releases a Full HD version of it coz its meant for digital art! This beauty will appeal to android nation, and the gorgeous iPad mini will continue to do well with iOS users, and the general consumer. It's a stalemate as far who'll switch over, cause most people are vested in the Eco systems of the chosen platform. This is true. I didnt understand about eco systems....until I invested heavy in Android. I came from Win Mo...but didnt get alot of apps. I didnt stick with Win Mo long enough to be invested heavy. I can do it for game consoles. Not that big a deal. Tablets? Hard to say. PC's? I can do that too. So the battle of the low res tablets that will unfortunately sell pretty decent? Ipad mini vs Note 8. Only tablets I am interested in are the high resolution ones. So Galaxy Tab 3 plus or bust Samsung. A high res Nexus 7 reboot would be awesome as well. looking forward to the review, Wish my N7 had a Sylus like the Spen and been asking for this for a while... also why saying Samsung is planing this because of the iPad mini?